The Trump administration has completed its plan to roll back major offshore-drilling safety regulations that were put in place after the Deepwater Horizon oil rig disaster in 2010 that killed 11 people and caused the worst oil spill in American history. Story here. 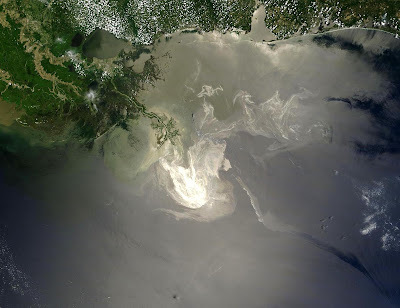 The Deepwater Horizon oil slick from space. Photo by NASA. Make no mistake. The Trump administration is no friend of Planet Earth nor its inhabitants, human or otherwise.